First thanks to Wim for kind permission to upload this great WSGT Mod by RMT for GTR2 at nogrip : this mod is still one of the best after 10 years and many other 3rd party mods require it. The only modification I have made from original is the WSGT MENU which is not enabled by default but available in an [OPTIONAL] folder in order to avoid overwriting of 3rd party menus such as advanced-FFB or DucFreak's GTR2 UI MOD and 10th Anniversary Edition. ATTENTION your menu will be modified so it is NOT recommended to use this option if you already have advanced-FFB or DucFreak's GTR2 UI MOD and 10th Anniversary Edition. The mod includes 47 cars from the 2007, including 9 updated or new car models – Including cars such as the Dodge Viper CC, the Lamborghini Gallardo and the Corvette Z06R. All cars come with brand new, scratch-made physics, reflecting the closely-balanced competition the GT3 series allows. When you had extracted this mod paste "Mosler MT900M Teams" file folder to "GTR2\GameData\Teams\SGT\GT300"
Thank you for download and comments. The quality is outstanding, both cars are modelled exceptionally well and include nice details such as a full working rear-view camera in cockpit. The sound of the R8 is worth the 200MB download alone, even though I am more of a BMW guy myself I have to admit the sound of this beast is nothing short of addicting. The R8â€²s screaming V10 is partnered with the deep bassy V8 sound of the RS4 which is very pleasant too. Give these babys a try, theyÂ´re definitely worth it. All cars can be selected bij choosing "GroupC" in the Class menu under Protoracer International. World Super GT Mod v1.0 by Racers Modding Team REQUIRED !!! This mod don't replace, overwrite or complete any existant mod, it is fully independant and appairs as a new class. This is a conversion of the original cokemoke f to gtr2. back from the beginning of gtl, here is a revival version of the famous coke moke made by SE7EN. "do what you want but remember where it comes from"
so be nice and feel free to change what is wrong..
-Steel brakes for LM600, RT10, 1996 IMSA GTS-R. Works good before heating to 600 degrees Celsius. http://archive.org/web/ - great thing! help me to find infos in old pages which is not available in web now! 2015/05/02 : v4.0 : NEW HONDA HSV-010 GT 2012 addition. Added the NISSAN GT-R 2013. Added the LEXUS SC430 2013. Added the LEXUS SC430 2012. Added the NISSAN GT-R 2012. 2012/09/29 : v3.3 : Update of 2011Skins &　Physics & other. 2012/05/04 : v3.2 : Update of Physics. 2011/11/26 : v3.1 : 2005-2010 ALL SKINS addition. HONDA HSV-010 GT deleted(The author wishes.). 2010/06/13 : v3.0 : HONDA HSV-010 GT addition. 2010/02/01 : v2.5 : BUG FIX & Adjustment. 2010/01/27 : v2.4 : BUG FIX & Adjustment. 2009/12/26 : v2.3 : BUG FIX. 2009/12/21 : v2.2 : BUG FIX. 2009/12/19 : v2.1 : BUG FIX. 2009/12/19 : v2.0 : First Release. The basic car (BMW Z4 M Coupé GT) comes from SimBin Development Team AB (GTR Evolution). I have optimized and adjusted the whole thing, to a VLN Specials version. • Optimized materials and material settings for better graphics. • Proper splitter, wing and front diffuser have been built. • A bit of a different cockpit. • Created whole new physics for the car, suspension, aerodynamics, dimensions etc. • New engine and gearbox. • Bigger tires with more grip. • A dry weight of 1250 kg. • Ratios to around 300 kph. • A rev range from 8500 to 9100 rpm. • Tire sizes of F: 300/680 x18 and R: 370/705 x18. • A wheelbase of 2505 mm and a track of F: 1670 mm and R: 1586 mm. The suspension dimensions/positions are fixed, to get them as real as possible. • A length of 4218 mm, width of 1996 mm and height of 1200 mm. • Front overhang: 918 mm, rear overhang 795 mm. • Undertray parameters, which should match the real car by 90% (90% because of the splitter, diffuser and floor changes). • A dry weight of 1275 kg. • A rev range from 7200 to 7800 rpm. I have done a lot of time consuming research of the real BMW Z4 M Coupé GT and did my best to get the car to the standards I like. I searched for everything possible to get the car's real specs, implemented them into the game and adjusted them to SP7/8 levels. Also a lot of testing on a many different tracks and development went into this mod, since the idea of it. I expect the needed respect for this mod and don't want to see any work of mine getting messed up. • To use the mod, simply extract the GameData folder to your GTR2 folder and let things be overwritten. • Make sure that you keep the original folders in the .zip file, to get everything to work properly (diagrams etc.). • The used sounds are all GTR2 standards with a few .aud file adjustments, so no complicated researches are needed. • Nothing of any original game content will be overwritten. otherwise simply change the class line. delete the ULTRA_TEX.GTR in the car's folder. • Templates are included, should explain itself. • In some situations the cockpit windows *can* cause some track textures to look incorrect/shine through. I am not responsible for any damage or malfunction on your soft- and/or hardware. You alone are responsible for that and take the risk, if you install this mod. I don't want to see any conversion to other games and/or platforms without my permission! Respect my work and don't do anything you would regret, if you wouldn't sit in front of a computer screen. I do not own any rights on the used logos, all of them belong to their respective owners! BMW, the BMW logo, the Z4 name, logo and it's design belong to the BMW AG, Petuelring 130, D-80788 Munich. BMW M and the ///M logo belong to the BMW M GmbH, Daimlerstraße 19, D-85748 Garching. Margarete Steiff GmbH, Richard-Steiff-Straße 4, D-89537 Giengen. Since the car was too low poly for GTR2, I worked on him. New External cockpit, engine, gearbox, exhaust, seat, steering wheel, windows, roll bar, Rim, tyres, etc. and from other vehicles from the game GTR2, GTL, SCGT and F1 Challenge. In addition to the modifications I made a 2048x2048 template and 14 Skins. This modification is of course a non-profit project. Now I can only hope that you enjoy the mod as much as I do. the original cause, but please let me get the files. can do so without permission. Would appreciate a short message. - Thanks to Goresh for all his great tips and help. - No original game files will be overwritten. I have optimized and adjusted the whole thing, to a GT2 version. I'm a good fan of the GT2/GTE class, but I think there are just not enough cars. • Bigger tyres with more grip. • A dry weight of 1145 kg. • Ratios to around 290 kph. • A rev range from 8400 to 9000 rpm. • Tire sizes of F: 295/705 x18 and R: 325/705 x18. • A wheelbase of 2493 mm and a track of F: 1700 mm and R: 1600 mm. The supsension dimensions/positions are fixed, to get them as real as possible. • A length of 4141 mm, width of 1974 mm and height of 1200 mm. • Front overhang: 861 mm, rear overhang 786 mm. • Undertray parameters, which should match the real car by 95% (95% because of the splitter, diffusor and floor changes). I searched for everything possible to get the car's real specs, implemented them into the game and adjusted them to GT2 levels. 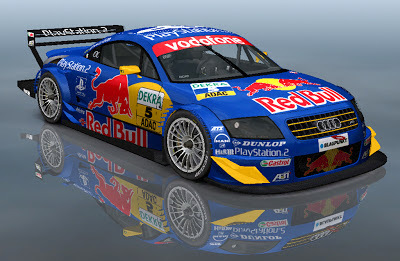 • You can find the car in game under Specials -> Bavarians, otherwise simply change the class line. • There is an optional clean version of car #22, if you prefer that one, simply copy the two .GTR files of the folder to BMW Team PRD. • Templates are included, should explain itself, but if you want to paint a car please only use body style 1 or 2. 3 and 4 have individual masks. • In some situations the cockpit windows *can* cause some track textures to look incorrect.